As we close out September, and my two months of Sunday Edition (it’s just the way it worked with vacation and such as we were divvying it up — I’ve loved having the extra time with y’all! ), I figured I’d do another update on my temperature blanket and my knitting project. I’ve been plugging away at the shawl I’m knitting as well, although I’ll be honest, I only do a row or two a day, so it’s taking a loooong time. Still, we’re nowhere near shawl weather, so there’s time. I do think I’m at the half-way(ish) point now, or very close to, so that’s good. It dangles off the edge of the table maybe three or four inches? I love the way the pattern has shaped up and I’m looking forward to when it is cool enough to wear! Liwen Ho’s winner is Janet Estridge! Did you know InspyRomance hosts a Christian Romance Reader Gathering group on Facebook? Join us… but don’t forget to answer the questions for admittance! Tomorrow (10/1), join us in the group when Janet Ferguson takes over from 3-5 p.m. central! 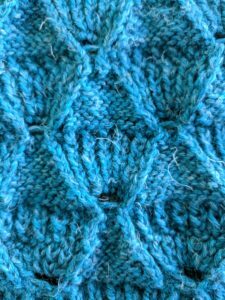 A closeup of the pattern in my shawl. They’re fish! Aren’t they cute? On Monday, Staci Stallings talked about fear and trembling. On Tuesday, Melanie Snitker talked about the magic of rain. On Wednesday, Marion Ueckermann talked about a sticky mess. On Thursday, Elizabeth Maddrey asked about tired tropes. On Friday, Cecelia Dowdy introduced us to caramel kisses. On Saturday, Janet Ferguson talked about the beach and Christmas. Hi Elizabeth, your weather blanket is looking great. If I were making one for here in Australia, it would be the opposite colours:) Friday and Saturday were drizzly, cold, grey days. Finally, about midday today (Sunday) the sun came out enough to burn off the clouds and warm things up slightly- a beautiful afternoon:) We always say though that we cannot plant a summer crop in the garden until after Melbourne Cup weekend (first weekend in November) as before then we still get frosts. Enjoy autumn as it takes hold for you. PS, the shawl fish are cool! It’s always so fun to think about y’all in the Southern Hemisphere just waking into spring and then summer as we hit fall and winter :) Enjoy your warming weather as I look forward to the cold! 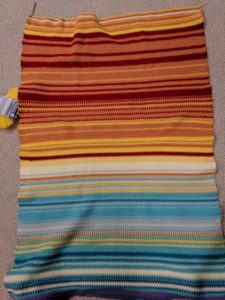 It occurred to me the other day that it’d be fun to do another temperature blanket but do weather instead – different colors for sunny, cloudy, rainy, etc. I’ll have to ponder that at some point. I was just talking to one of my friends last night that I need to learn how to knit and crochet. The shawl is so pretty! Hi Elizabeth! Your weather afghan looks similar to this year’s Michigan weather. Never learned how to knit, my grandmother and mom were talented. I enjoy crocheting shawls and your pattern looks unique. Love the blue aqua color. Hard to believe tomorrow is October 1. We are finally experiencing fall weather and the leaves are starting to turn. Apples, grapes, and pumpkins are being harvested. Can’t wait to take the grandkids to the neighborhood pumpkin patch for a photo shoot. Best wishes to all eight writers on your boxed set release Tuesday A Christmas to Remember. Readers, order your set today. Inspiring stories for a reasonable price. Blessings. We are looking forward to the pumpkin patch here as well! I need to figure out when we can make it though, our calendar is always so full. And yes! I’m excited about Tuesday’s new release. Thanks for mentioning it! Hi, your handwork is beautiful! I love the colors. Hope you finish the shawl in time for cooler weather! Happy reading! The.blanket looks amazing…and the shawl is so beautifully done!! I too am looking forward to cooler days, we are still hitting 90s here!! ugh! The fish in your shawl are neat. I love the temperature blanket, too! Your shawl is going to be beautiful. The temperature blanket is neat. 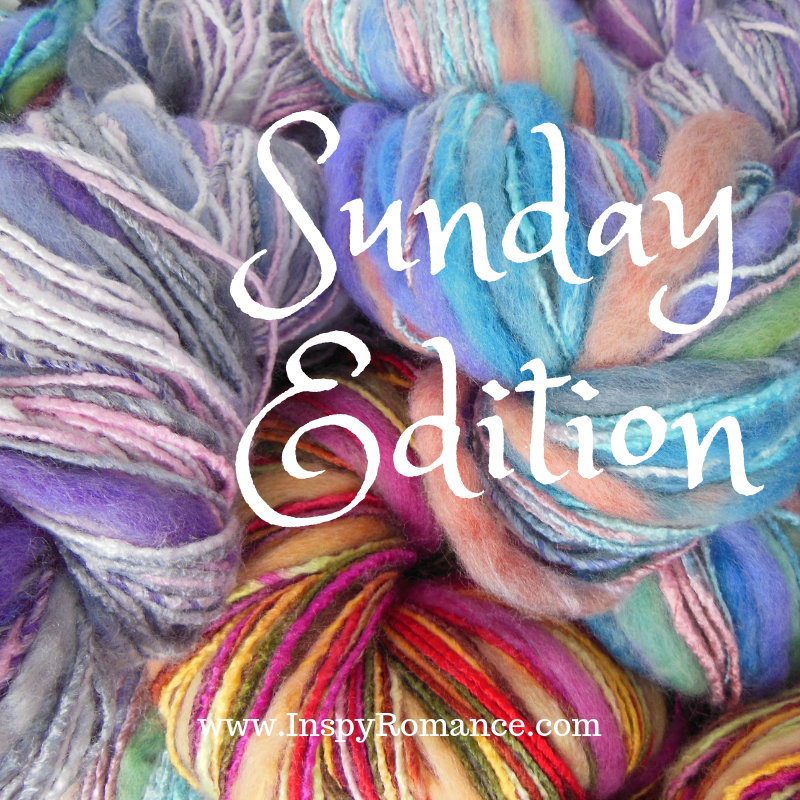 The blanket is beautiful I would love to learn how to knit Thank you for this Sunday Editions Have a Great Sunday! I know what you mean, one week it’s cool, the next it’s warm again. Ready for Fall weather for sure! Your beautiful shawl and blanket will be nice when it does get here. 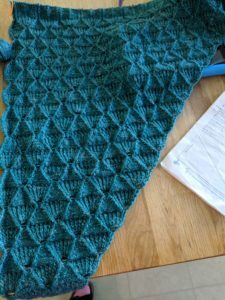 Both projects are looking great and I love the pattern in your shawl. I don’t remember seeing one like that before. The blanket and shawl look gorgeous! You are very talented! Thank you. I will say I consider it less a talent than being able to read instructions, but that probably undersells it some. It dipped into the mid 60’s a few days here too. Then today, back up to 85 and humid. I’m so ready for fall and I thought it was here. I’m really impressed with your knitting.